Look for the best quality coat you can afford, and purchase from the most reputable dealers you can find. Research sellers before you buy. You should communicate with at least five separate fur salons prior to purchasing a coat. Visit each store and compare what you can get for the same amount of money at each. Visit stores other than department stores. Many department store fur salons are run by the same company and have very similar selections and prices as a result. Check out a few independently owned stores, as well. Check the tag for the origin of the fur. A quality coat should list where the fur originated from, and the highest quality coats will have fur that originates from certain countries. Look for a mink coat with pelt origins in the USA, Denmark, or Finland. Mink coats from Norway, Sweden, China, Canada, and Russia come next. Search for sable that originated in Russia and lynx pelts that originate from North America. Purchase a fox fur from Finland. Look for a Canadian origin for beaver furs. Check the tag for the manufacturing location. The highest quality coats often come from Europe and North America. Most furs come from China, however, and you may still find a quality coat manufactured there. Check the inside of a coat before purchasing it. Most quality furs have an open hem at the bottom of the lining for this purpose. Note how clean the stitches are, and whether or not any fur got caught between the stitches. Check how much leather was used in the let-out process. Lower quality furs have an underside striped with leather, while the highest quality furs have no leather at all. Ask how much leather is included in the coat to create the most accurate assessment. Note the color of any leather used on the underside. If you select an un-dyed coat, the color of the leather should also be natural. 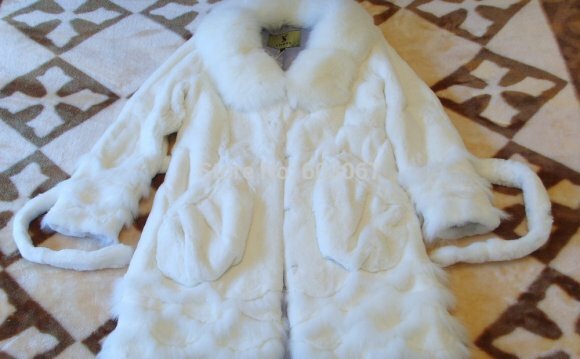 Mink, for instance, should naturally have a creamy off-white leather. Look for an un-dyed fur. Dye does not harm fur in any major way, but it does impact the texture of the fur. The highest quality furs are typically un-dyed. Look for designer labels. Not all quality furs come from known designers, but a designer label does suggest that you have a high quality fur in your hands. Before you worry about inspecting the quality of a fur coat, you must determine what type of coat you want to shop for. Consider why you want a fur coat. Look for a trendy cut or colored fur if you want to make a fashion statement. Buy a more traditional fur coat if you want it as a long-lasting investment piece. Go with rabbit, fox, sable, or chinchilla if selecting a trendy design. Choose mink for a blend of both style and weather-resistance. Pick out a color. Each type of fur comes in a variety of colors. Decide on a color before you go shopping so you can narrow your search. Decide from a vast array of colors if going with mink fur. Natural mink fur is available in a shade of black known as "ranch mink, " as well as various shades of brown, white, and gray. Decide on a length. This will also narrow your search. Determine your budget. Know how much you can afford to spend, and buy the highest quality coat you can afford based on that amount. Quality mink coats tend to be expensive, but you can find other high-quality furs, such as sheared beaver, at a lower price. Making your own drum pad? Be on guard for sellers who try to pass fake fur off as real fur. Always check the reputation of a retailer before purchasing a fur from them, and always check the quality of a particular coat before buying it. If you find a slightly damaged coat that has a small tear or bald spot, ask if you can get a discount on it. This drops the overall quality of the coat, but small imperfections may not be noticeable. What to wear with Faux Fur Vest? What to wear with Fur Vest?